* This post is dedicated to my Great Uncle Harvey who passed the day after I wrote this story. His joy for life will be remembered this holiday season and forever in our hearts. There is something lovely about the anticipation of the Christmas season. We put up decorations, sweetly adorn cookies and gather with loved ones around a fire and sing Christmas carols. We ready our spirits and hearts in good tidings and joy. We smile at strangers passing by and wish them a Merry Christmas. The preparation of the season is as special to me as Christmas day itself. Everyone has their own way of preparing for the holiday, and for some, it might come in the form of fruitcake. Every Christmas season, like clockwork, my grannie, her sister and their patient and loving husbands cleared off their dining room table to produce piles and piles of bar-shaped, bright green and red studded no-bake fruitcakes. For hours upon hours, the four of them would sit and talk and chop and package these speckled sweeties in cellophane wrappers to pass out as gifts to neighbors and friends. So, in the honor of the anticipation of the season, here is a fruitcake, steeped in spices and floral honey, studded with winey dried fruits and fresh orange juice, then baked till the whole kitchen smells undeniably like Christmas. I’m not sure of the exact origin of fruitcake, but like all languages, traditional recipes are ever changing, ever adapting, ever breathing. I just so happen to be Southern, so I deem this cake a Southern fruitcake by way of geography. Nonetheless, wherever you are this Christmas, I wish you peace, hope, joy and love. May your holiday be merry and bright, and may your kitchen be filled with fervor, family and fruitcake! Note: To make this fruitcake a showstopper, just before serving warm a little rum or vanilla-infused vodka in a small saucepan. Bring the cake to the table, along with the warmed alcohol and a long match. Turn off the lights. Carefully light and pour the flaming alcohol over the top of the cake. Allow everyone to coo over the cake for a few more moments before serving. Put the fruit, butter, brown sugar, honey, coffee, orange juice and zest, cinnamon and cocoa powder into a medium saucepan on medium-low heat. Bring to a slow boil, stirring as the butter melts. Allow the mixture to simmer for 10 minutes, then take it off the heat and allow to cool for 30 minutes. Whisk flour, baking powder and baking soda together in a small bowl. After the mixture has cooled for 30 minutes, add the eggs and flour mixture to the fruit mixture. Stir to combine. Pour the fruitcake mixture into the prepared cake tin and bake for 1-1 1/2 hours until the top of the cake is firm and has a shiny, slick look. I make sure to check the cake after 45 minutes though. The center will still be a little gooey. 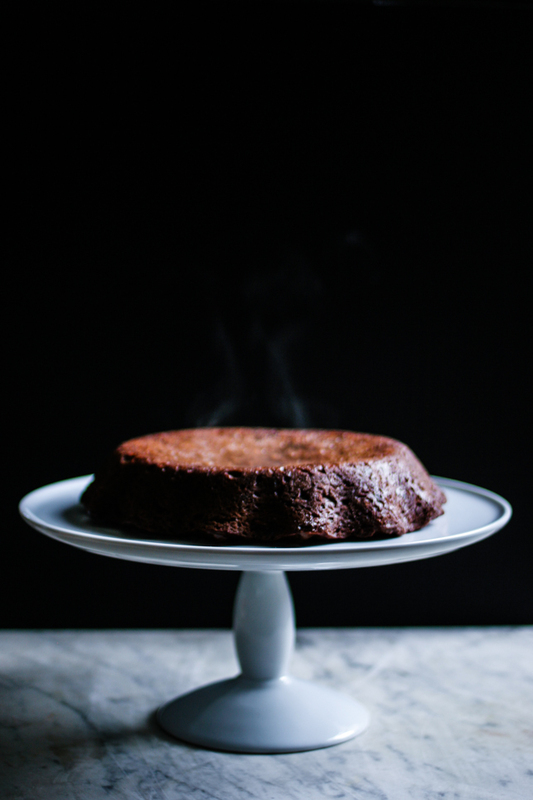 Allow the cake to cool on a rack until completely cooled and unmold the cake from its tin. Decorate however you like! Merry Christmas! Thank you! Merry Christmas and happy holidays to you too!